UPDATE, OCTOBER 2015: Lately there's been more discussion in the MIMP collecting community about whether or not these were ever actually released under the MIMP name. What is known for sure is that these figures were released under the name "Halloween Coffin Surprise." As far as I know, there is still no definitive answer as to whether they were actually ever released under the MIMP name. 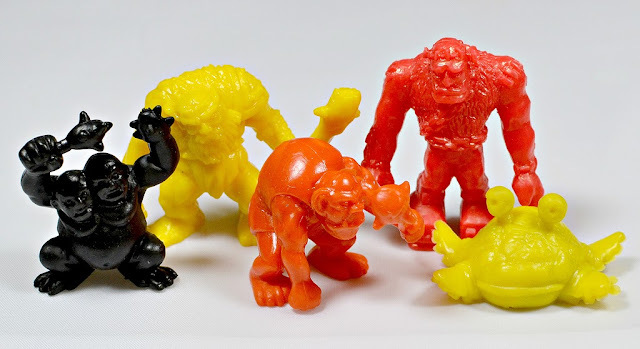 Back when I was a kid trying to get my hands on every Monster in My Pocket figure that I could, I had no idea that this toy line was popular far beyond my own little world, in other countries. 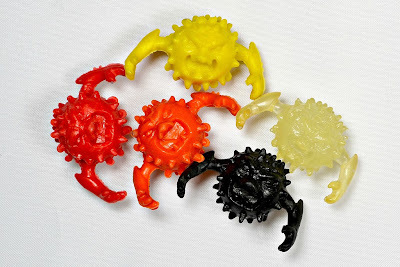 And I definitely didn't know of the existence of the figures pictured above, which are unique "Cromy Club" sculpts thought to have been sold under the Monster in My Pocket name in Argentina. As far as I have been able to tell, there's not a ton of solid information out there on these guys. Below is what I've been able to gather in my research, much of which isn't based on any hard factual evidence (so please note in some cases this info is just what I have read and believe to be true, not what I know for sure to be true). If you know something about these that I don't, please feel free to leave a comment and fill me in. It seems the figures were released around the same time as standard MIMP toys (early-mid 1990s) by a South American company named Cromy, I assume based in Argentina. The company looks to have mainly made small toys and trading card/sticker albums. There is a site in Spanish devoted to Cromy items here. They were re-released in some capacity over the past few years (here's a video of a guy unboxing some). The original sculpts seem to have been produced as an extension to the Matchbox-originated standard MIMP sculpts, which were also reproduced by Cromy. It is generally accepted that these figures fall under the MIMP name, however I'm not sure if that's ever been confirmed. A photo in this thread over at LittleRubberGuys.com shows a couple of them packaged with a MIMP header, but there were questions about its legitimacy. By my count, there are 25 unique sculpts (more on each sculpt below). If you know of any additional sculpts not shown in this post, please let me know. Unlike their original MIMP counterparts, many of these figures do not appear to be based on creatures from mythology; instead, they seem to have come from the imagination of whoever sculpted them. They're made of a similar type of rubbery soft plastic as regular MIMP figures. For some reason, though, some of them are more rubbery and glossier-looking than others. The figures came in five main, Halloween-ish colors: Red, orange, yellow, black and clear white (which is possibly glow-in-the-dark...I need to check!). However, versions of these figures also came in colors not shown above--specifically transparent neon colors. I've seen these alternate colors referred to as rarer, but I don't have enough information about them to know if that's true and exactly how they were released. When I was going through all of the 25 different sculpts I own, I noticed they could be loosely categorized into types by their different characteristics. Let's take a look at each of them more closely based on their respective groupings. NOTE: THE NAMES BELOW ARE NOT OFFICIAL. I MADE THEM ALL UP FOR THIS POST. Barg: A really ornery-looking guy in a crouched, animal-like position. Dreg: A hunchbacked ogre with a spiked club. Ogg: This guy's different from the other ogres but he made the most sense in this group. A tubby, bizarro monster with a spiked belt and spikes on his head. His arms are raised and he looks like he's roaring. Arg: Another hunchbacked ogre, this one carrying an axe and an evil expression. Grug: A two-headed ogre with a spiked ball for one hand and a spiked club in the other. My favorite! Next up are "The Creepers." These guys all share characteristics based on reptiles, amphibians or other creepy creatures. Gulper: A frog-like creature with huge feet and outstretched arms. Hisser: A giant cobra monster. Strangler: A humanoid-octopus creature with a bulbous head with large tentacle-like mandibles coming out of it. Grabber: A lizard monster with large feet, long, thin arms and a large tail. Slither: Another snake monster, but unlike Hisser he has arms. These five guys I'm calling "The Brutes" because they're the bulky muscle-dude ones of the bunch. They are also based on animals, but in this case mammals. Minogar: A minotaur wielding a large shield and a spiked club. Wrecker: A creature in a ready-to-rumble post with a huge, gaping mouth and large round eyes. I'm actually not sure what creature he's supposed to be based on. A hyaena, maybe? Spiker: Not sure what animal this guy's supposed to be either, but he's different from the rest in that he has a spiked tail. Basher: I think this is another bull-based creature? Or a warthog? Not sure, but he's got horns and a tough pose. Snort: A hog-man to round out the brute gang. Here we have "The Critters," winged and/or insect-like monsters. Vampex: A fairly typical-looking vampire-bat creature. Yowl: A cross between a bird and a dragon, I think? Mosquitoid: An insect/mosquito creature that's also a bit mechanical-looking. Doom-Bat: A large, screaming head with spikes on top and huge bat wings sticking out from the sides. Love this one! Double-Drago: A two-headed winged dragon. The final group of five is "The Freaks." All of the Cromy Club figures are freaky, but I'm calling these guys in particular the Freaks because they don't really fit in among any of the other common attributes of the other groups. They're just random weirdos. Devil-Mummy: Just what the name says. He's also warrior-like, sporting a cape, large shield and sword. Slobberus: A weirdo crab-alien creature with tentacles and googly eyes sticking out of its body. Badwood: A straightforward dryad/tree monster. Doom-Ball: A small spiked ball with a mean-looking face and arms. Another favorite! Evil Master: A staff-holding "wise master"-type character with an evil bent. I like to think of him as the controller of all the other monsters. And that's all of them! At least that I'm aware of (again, any additional information would be appreciated). Personally, I'm a huge fan of these Cromy figures and think they're an awesome addition to the MIMP universe. What do you think of them? Got a nice little bagful of them now, but not all of the sculpts - some of these I'm seeing for the first time here! Slobberus looks fantastic, I don't have him... Have you noticed these figures are a lot more "oily" than your standard MIMPs? As in, I have to wash my hands after everytime I've had a look at them. Especially with the black ones. I have noticed that a bit on a few of mine, but from what you describe not nearly as oily as yours. It does seem to be more on the black color. Wonder what causes that. I love that shark lookin' dude in the first picture! I see now he is called "Gulper." And apparently not-so shark-like. I'm very intrigued by these guys. I don't think they were ever officially MIMP, were they, just put out under the name? I've got one anomalous creature that turned up in a box of figs I bought on eBay. It's a rubbery winged dragon in a purple that's pretty much the same as the original MIMP S1 purple. And he has a points value stamp on the back. Doesn't match any of the figs above, but no one can come up with any idea what else it might be. Yeah, I'd imagine Cromy just went ahead and used the used the MIMP name for them. I'd love to see a pic of the purple figure you describe. Sounds interesting. I'll email you some shots of it. It's a fun little oddity. Neat figures. I'm especially envious of that transparent pink Snort. The clear white ones do glow in the dark? Just checked, the clear white ones do glow in the dark! I saw that auction with the Kali-type figure and wondered if it were one of these. I ultimately think no mostly because I've never seen another one in any lot of Cromy figures. Can't be sure, though. Thanks for the link to that photo! Cool, hopefully you can get that lot for a decent price! Yeah, I think that packaging is from the re-issues. I wonder if they mean 100 different ones including color variations. I saw in one of the videos some of the reissues are made of a stretchy material too. I got the lot off ebay! I doubt that Kali figure is part of this line & i agree with you're comment about there being 25 sculpts being repeated over in 4 colours. I hope the stretchy figures don't become sticky over time and attract dust..
Nice! You'll probably have most of the sculpts then, right? Word of warning: for some reason these things always seem to come really dirty. But most of mine cleaned right up with a hot soapy bath and toothbrush scrub. Hopefully around that mark! I scored a few other lots of about 10 off ebay too so should be around the hundred figure mark in a couple weeks time. :) Might do a mini review on them. Thanks for the advice, i will be doing just that! I hope they're not too grubby or at least clean up ok. Stoked i scored a clear orange arg figure in one lot! At least some of these guys look like they are from Argentine folklore and mythology. In particular, "Doom-Bat" seems to be a chonchon and "Double-Drago" looks like a huayrapuca. Thanks for your comment. For some reason I hadn't thought of the bat guy as a chonchon, but it does seem like it's probably meant to be one, now that you mention it. I'm not familiar with the huayrapuca--will have to go look that one up. Hey, I am glad you were able to find the answer here. I believe the ones in the links you posted are newer versions that were released within the past few years. I believe the original ones like in my photos were from the '90s. Hi—among MIMP collectors it has been assumed these are Cromy Club figures and that they were released under the MIMP name (someone posted a packaged photo showing the MIMP name at some point). What other info can you give me on these figures? Who made them, how were they released and what were they called if not MIMP? Thank you! Hi, I meant to respond to this comment months ago. If not made by Cromy, who made them? What other information can you provide? Hi there...thank you for that information! Hi LIttle Weirdos! Is the sucker blow gun sold on e-bay? I own the darts but not the blow gun! Hi, I assume you are talking about LJN's Suckers? I think this might have gone on the wrong post. Anyway, I can't recall if I've seen the blow gun on eBay, but it would probably be the most likely place to find one.